My October was quite busy and I had to seriously simplify the things that needed to get done. Trying to come up with an impactful but fun costume for my 2 and half year old was the challenge! 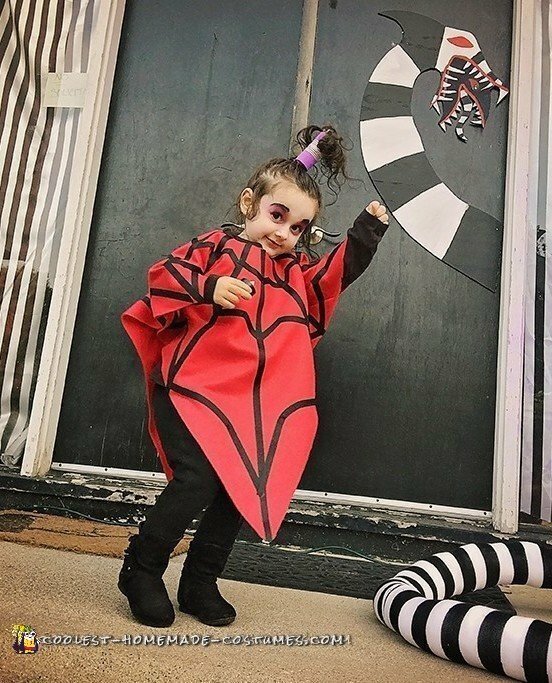 I had decided on Lydia from Beetlejuice but instead of just dressing her all in black or red I wanted to bring to life the adorable Beetlejuice cartoon which features Lydia in a red and black spiderweb poncho with her hair piled high in a pony tail. The costume was super easy to make, just took some time. I made a quick pattern based of a long sleeve dress I knew fit her well since measuring a toddler that has to always be dancing was impossible. I cut the costume out one folded piece of red fleece and the only seams were for the arms. The black detailing is iron on bias tape which I did manage to iron to the rug late at night. She just wears all black under the costume and her hair was plenty long for that crazy ponytail. I stacked two thick rubber bands to give it stiffness and height and then wrapped some of that craft foam around the ponytail and clipped it, so it resembled the cartoon more. I’m surprised I got any make up on her, but now she thinks every time we go into the bathroom she can wear make up. I had just enough time to cut out some quick decorations out of insulation foam and painted up a tombstone and two sandworms. I also made my daughter a stuffed sandworm out of some striped tights I had. 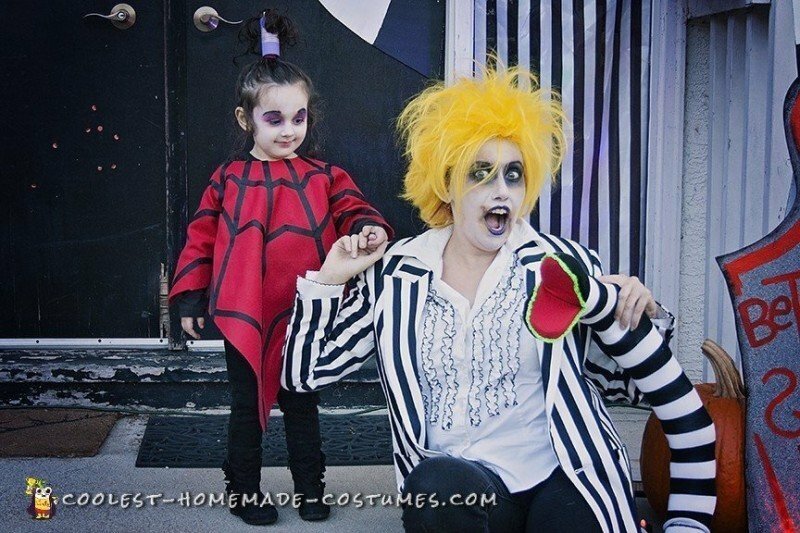 And I always join the fun and got done up as Beetlejuice. What was the most shocking thing about Halloween night? All those awesome trick or treaters who recognized us! 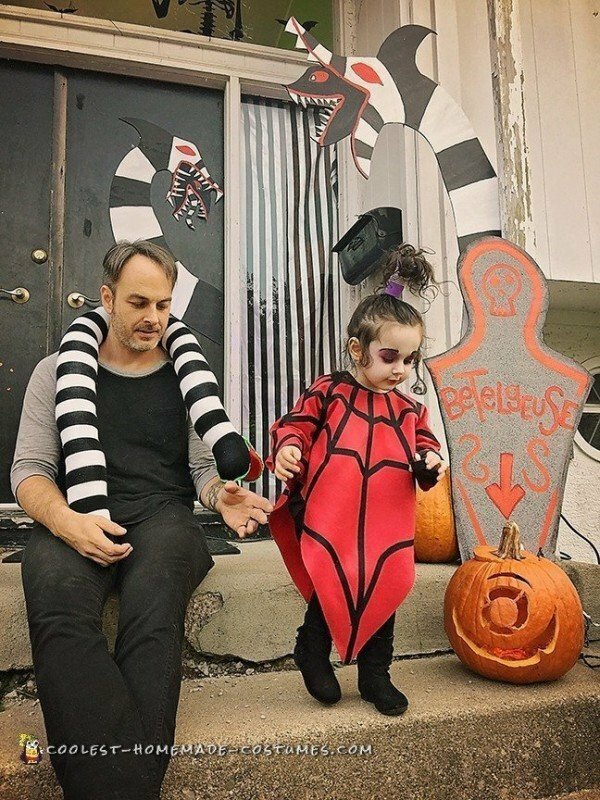 I was afraid that movie might have dated us, but everyone was telling us how they loved Beetlejuice. 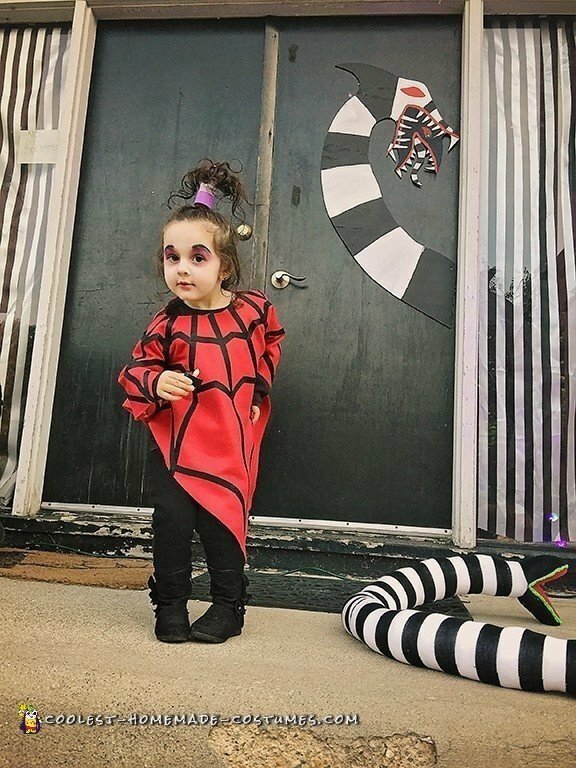 Everyone got the biggest kick out of our little Lydia who didn’t like trick or treating as much as she loved passing out candy to all the kids coming to our door. She took that job very seriously. The other job she took seriously was to dance on the porch as I played “Jump in the Line”.